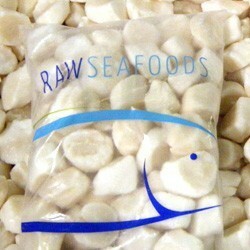 This Page is About: Raw Seafoods Inc. purveyors of fresh and frozen seafood - scallops, fish and value-added products. With Raw Seafoods, Inc. you can be sure you’re getting the highest quality seafoods & superior customer service. 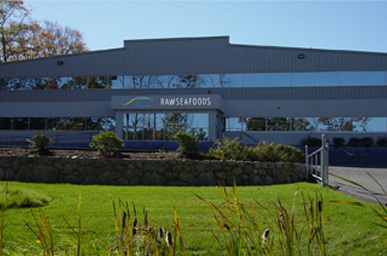 Raw Seafoods, Inc. is dedicated to providing our customers with exceptional quality, products, and service. Raw Seafoods is very proud to annouce a partnership with Global Sustainable Seafood Initiative (GSSI). 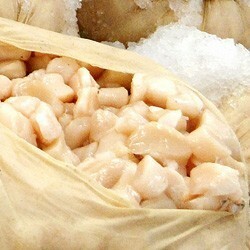 Our fresh sea scallops & fish are sourced from a variety of boats & off-loading facilities along the Atlantic Coast. All scallops are hand graded for uniformity of size & minimal pieces prior to entering our state-of-the-art freezing tunnel. 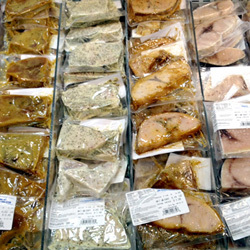 Our vacuum pack program offers retail and food service customers a wide variety of high quality seafood choices. 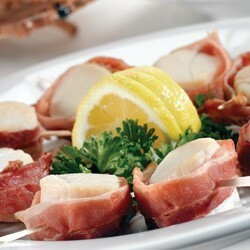 Products include catering & party appetizers like bacon wrapped scallops & shrimp handmade to your unique specifications.